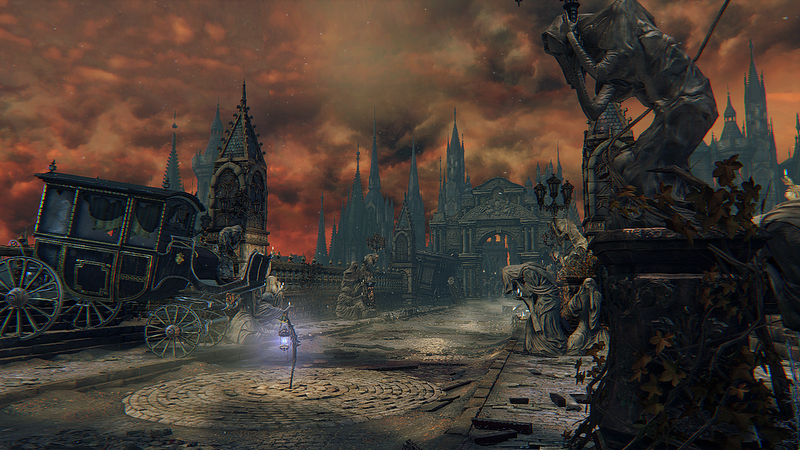 Central Yharnam is home to imagery both terrifying and tranquil, with a complex network of cris-crossing roads, paths and bridges, Home to blood ministration and massive churches, Yharnam is haunted and yet, at times, disarmingly beautiful. City area with intricate maze of bridges and structures in the center of Yharnam. Very large and complex, with many shortcuts and secret paths. Exploring and finding hidden routes is essential. Many of Yharnam's residents have locked themselves inside their homes for fear of the beasts. 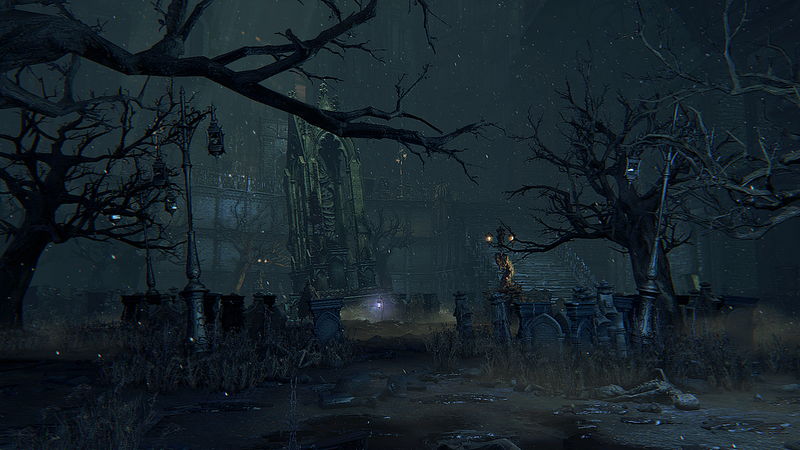 The world of Yharnam is full of secrets and surprises waiting for the curious and careful Hunter. Search every nook and cranny, and even listen for cues that might signal something, or someone, interesting. Many boxes, crates and other objects can be destroyed, leading to hidden items to aid you in your quest, or even shortcuts and hidden areas with more to explore. Gilbert can be found in Gilbert's House right next to Central Yharnam Lamp, you can hear his coughing when nearby. If you're playing online, and made it to the Cleric Beast but were defeated, it's worth returning to the Hunter's Dream so that you can acquire the Beckoning Bell if you have not already done so. When you then make your way back through The Plaza you'll notice a new brightly lit message just to the side of the central fountain (a similar one can also be found just down the stairs from Gilbert's Gate if you're coming from that direction). This message gives you a hint about using the Bell to call for assistance if you're having trouble. Doing so will summon aid, in the form of Father Gascoigne. From that point on he will stay with you until you either reach the Canal area, or face the Cleric Beast. He's a powerful ally, so once you have him at your side it's well worth taking the time to lead him to any enemies that are still alive in the area, as he will help to dispatch them. This is especially worthwhile if you've yet to go through the Bridge Residence to unlock Gilbert's Gate. Henryk in Tomb of Oedon: Old Hunter Henryk will be located in Tomb of Oedon as part of the Eileen the Crow quest. Speak to her outside of Oedon Chapel in Cathedral Ward after opening the gate to round plaza, before triggering the nighttime by examining the skull in Grand Cathedral, and she'll tell you about Henryk, her current assassination target. If you head straight to Father Gascoigne's boss area after Eileen warns you about Henryk, he will attack you immediately and Eileen will arrive partway through the battle to assist you. If you reload the game after receiving Eileen's warning, she will already be fighting Henryk when you arrive. Sinister Bell Ringer (Online): Bell Ringer is located at Dry Dock - Rafters in side area with Eileen. When “bell-ringer woman” is present, versus PvP invasions are possible. Central Yharnam | Bridge Residence: When the hunt began, the Healing Church left us, blocking the great bridge to Cathedral Ward, as Old Yharnam burned to the ground that moonlit night. Central Yharnam | Oedon Chapel Basement: The Byrgenwerth spider hides all manner of rituals, and keeps our lost master from us. A terrible shame. It makes my head shudder uncontrollably. Old Hunter Father Gascoigne: Summoned by the fountain past the burning effigy the townsfolk gather around. (Note: This is now the ONLY place he can be summoned from, as they removed the location by the Central Yharnam lamp behind the shortcut door. He will use Silencing Blank if you enter the sewer. This works before you initiate Father Gascoigne's boss battle, but after you start the boss battle against him, he can no longer be summoned for this fight. Old Hunter Alfred: Summoned by the Gilbert's House down the stairs shortcut from Central Yharnam lamp. You must have spoken to Alfred and agreed to cooperate with him. If you shift time into the Night, Alfred moves to his new position outside the Forbidden Woods, his summon signs disappear and won't be available for the boss fight. Pick up the Torch in the Plaza. Kill the Cleric Beast to acquire the Sword Hunter Badge and gain Insight to allow character leveling in the Hunter's Dream. Enter the Dry Docks to acquire the Saw Spear. Get the Saw Hunter Badge from the Boar Tunnel. Kill Father Gascoigne to acquire the Oedon Tomb Key so you can reach the Cathedral Ward. Open the chest at the end of the Chapel Path to get the Blood Gem Workshop Tool. 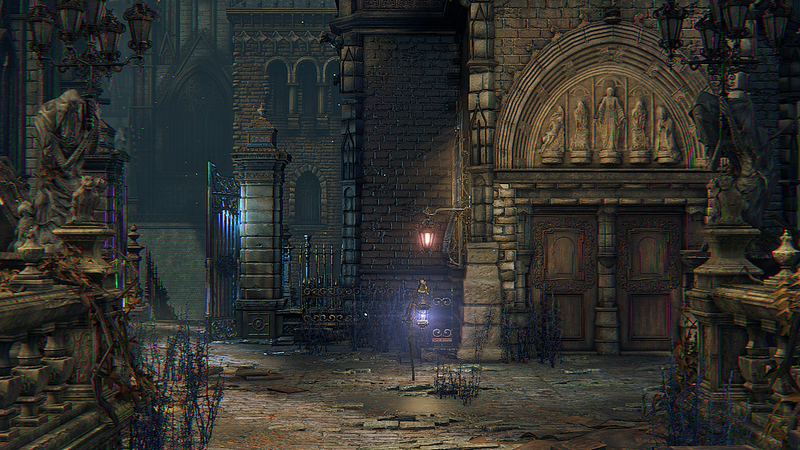 Upon reaching the top of the ladder you'll find yourself outside Gilbert's house, by the Central Yharnam Lamp. If you have not yet been to the Hunter's Dream to collect your weapons, use the Lamp here to do that now, because proceeding without them would be extremely difficult. Gilbert knows the area well and often has hints about places that you may want to investigate, so it's worth checking back with him often. After you've been to the Hunter's Dream you can also return to the Clinic and speak with Iosefka to get a potent healing item. As you approach the Overpass you'll be able to pick up a number of Pebbles that you can use to quietly get the attention of an enemy, or separate one from a group. A Huntsman will attempt to ambush you when you reach the other side of the Overpass, so don't run ahead too quickly. Once you've dealt with him you can either head down the stairway, or drop through a gap in the railings for a small shortcut. When you get to the top of the stairs overlooking Main Street, you'll, notice a large group of Huntsmen slowly making their way up the street. While you can wait until they're much further up the street before proceeding, it's best to deal with them sooner rather than later, so that you don't accidentally run into them further along the street. Wait until they're just past the bottom of the stairs, and then use a Pebble to attract one of the rear enemies and separate it from the group; once it's down, do the same thing again for one or two more until you feel comfortable finishing off any that remain. If you go back in the opposite direction that the group of enemies was moving in, you'll come to a gate that you passed shortly after exiting the Clinic, and you can open it now for an alternate route back to Gilbert's house. Also in this area is a small dead-end alley, where a dangerous Executioner lurks. This enemy can be very difficult to beat at such an early stage in the game, and since there's nothing to be gained from entering the alley, it's recommended that you avoid it until you're stronger. Heading straight up Main Street to the Hunter's Flame area will mean fighting a large group of enemies while dealing with ranged attacks - a daunting task if you're just starting out. An easier approach is to go up the small set of stairs behind the wagon on the right and take the path along the side of the main area. Kill the enemy at the bottom of the stairs before he wakes up, and head up into the small side area to the right to pick up a very useful weapon upgrade material - just be mindful of the enemy that will try to ambush you there. You can use this item to upgrade your weapon at the Workbench in the Hunter's Dream, so make sure you return often to keep your weapon as strong as possible. As you continue along the path, a bell will ring that causes the enemies in the Hunter's Flame area to begin their patrol routes. Some of them will then come up one of the central sets of stairs behind you, so be ready to face them. At the end of the stairs there's a small opening in the railings on the left, and this position gives you an excellent vantage point over the entire area. If you're apprehensive about engaging the enemies, it's possible to get through while only fighting a single Rabid Dog There are two groups of two enemies that patrol the area ahead of you, so watch their movements, and when they're nearing their furthest point away from the carriage, drop down. Move up until you can see the dog and use a Pebble to lure it towards you so that you can kill it away from any other enemies. If you timed things correctly you should now be able to walk up the stairs that are near the dog and continue along under the archway to the Plaza. If you run up the stairs the Huntsman on the carriage roof will hear you, so it's important to walk. Just past the stairs leading down to the Plaza you'll see a row of objects on the left side of the area, some of which can be broken to reveal a hidden gap in the railings; using your weapon to break the objects is recommended, to avoid accidentally rolling through the gap. Dropping down through the gap will take you to the Kennels, bypassing the Great Bridge and allowing you to either progress to the Dry Dock or work back around to create an easy path back up to Gilbert's Gate. You can also knock on the door of the house near the shortcut to speak to one of the local residents and hear their thoughts on outsiders. After heading into the Plaza you should first go to the left and take out the three Carrion Crows there. Individually they are fairly weak, but if they surround you they can be dangerous, so it's best to go in swinging and try to kill them as quickly as possible - then break the coffins they were guarding and claim the hidden item. Next, cross over to the other side of the Plaza, where you finally find out what's been pounding on the gate this whole time. The Huntsman's Minion hits hard, but since it has its back to you, you can run up behind it and get close enough to hit it with a charged R2 attack as it is turning around. If you then follow up with a transform attack combo to keep it off balance, you can nearly kill it before you need to back off and let your stamina recover. Once it's dead, make sure you pick up the Torch, and then continue up the stairs towards the Well. The Well can be difficult, especially if you run straight up the stairs, but if you're patient and tactical it can be done relatively safely. At first glance it appears that you only have to deal with one Rabid Dog patrolling the area between the top of the stairs and the Well; and another stationary one. When you reach the top of the stairs, however, a large group of enemies including a sniper and another Rabid Dog will come down the stairs. Try to deal with the two dogs that are already in the area first. Start by running up the stairs to the patrolling one and killing it as quickly as possible, and then throw a Pebble at the stationary one at the back if it hasn't spotted you already. Run back down the stairs so that it follows you, allowing you to kill it out of the patrolling group's line of sight. Next, run back up the stairs so that the sniper and one or two of the patrolling enemies spot you, and then retreat again. Once the Huntsman with the rifle spots you he will rarely change position, so you can use the railings and the wall to the side of the stairs as cover from his shots, to avoid worrying about him while fighting the others. Repeat this tactic for any other patrolling enemies, and then move up and take out the rifleman. Finally, if you did not kill the Huntsman's Minion that was pounding on the door at the Plaza, it will approach from behind when you enter the Well area, so make sure you're prepared for it. When you reach the top of the bridge, you can cross straight over it to find this small overlook area, where you'll be able to replenish your Pebble supply and pick up another Blood Stone Shard. You can drop off the ledge to get back down to the Hunter's Flame area if you wish, and if you've killed all the enemies then this can be a good time to head back and upgrade your weapon On the opposite side of the area there's an alley leading to another ledge that you can drop off; you'll land on a series of wooden platforms. These will lead you down to the Aqueducts, where you'll be able to find some useful items, and if you wish to return there's a series of ladders that you can use to climb back up. Upon dropping down to the walkways above the Aqueduct, you'll be able to see a number of Large Huntsmen patrolling around the area, so try to watch their routes and pick them off one at a time to keep the fights manageable. If you're confident in your shooting skills, interrupting their attacks so that you can stagger them for a visceral attack is by far the quickest way to dispatch them. Near the opposite end of the Aqueducts there's a beam with an item on it about halfway down the wall, and if you line yourself up carefully you can drop onto the beam to retrieve it Once you're on the beam, drop down again and kill the Labyrinth Rats below you quickly, because another Large Huntsman is around the corner nearby and you'll want to face him one-on-one When the area is clear, go around the corner and pick up the Attire set the Large Huntsman was guarding, and then either backtrack along the Aqueducts and use the ladders to reach the Main Street Overlook, or drop down to the Canals and use the ladders there to get back to the Great Bridge via the Plaza. Climbing this ladder will take you up to another small area above the canals, and if you head around to the right you can fight your way through a group of Carrion Crows to reach an item After crossing the bridge there's a door on the right that you can knock on to speak with one of the local residents. In the opposite corner there's yet another ladder that will take you up towards the Plaza, but standing below it is a Huntsman's Minion; thankfully he has his back to you, so you can sneak up and use a charged attack to stagger him from behind. Next to the gate at the top of the ladder you'll notice a glow coming from the window, and if you approach it you can talk to the Young Girl inside the house If you want, you can offer to help look for missing mother, and to help aid your search she'll give you the Tiny Music Box, which is useful in an upcoming boss battle. As you make your way along the Great Bridge you'll encounter two Scourge Beasts. These can be very dangerous enemies, especially when you have to face two of them at once. Running straight up and fighting them head on can be problematic because of how aggressive they are, so if you want to fight them on the bridge, it's a good idea to weaken them from a distance with Molotovs, or Throwing Knives if you have any. Alternatively, you can run past them and head into the Bridge Residence, where you'll be able to fight them in relative safety using long ranged attacks, since they cannot pass through the doorway. Opposite the Bridge Residence you'll find a set of crumbled stairs near some breakable objects. You can drop down from here, making for another shortcut to the kennels area. This will allow you to skip going through the residence and dealing with the Cleric Beast if you wish, but is not recommended for your first time through the area. Going through the residence will allow you to reach and unlock Gilbert's Gate and create an extremely useful shortcut back to the Great Bridge and later sections of the area; opening this shortcut is strongly recommended before you attempt to fight the Cleric Beast, so that you can quickly return if you're defeated. The residence itself is extremely dark, so it's worth equipping the Torch you acquired in the Plaza. There are two enemies hidden behind objects on the top floor - take them out first before proceeding downstairs. You'll be attacked by an enemy at the bottom of the stairs, so make sure you're ready for him, and then turn and start making your way towards the glowing item at the back of the room. When you get close you'll see a lifeless body in a wheelchair, but this enemy will spring to life when you walk past it for the item, so start attacking it as soon as you're in range. After exiting the residence you'll need to run up some stairs (taking out an enemy and picking up the Blood Stone Shard along the way) to reach the switch at the top, so that you can finally unlock this gate Once unlocked, you'll have a quick route from the Central Yharnam Lamp to both the Great Bridge and later sections of the area, making it the most important shortcut in the area. The final obstacle blocking your path to the end of the bridge is a group of enemies consisting of a Huntsman's Minion and three Carrion Crows. Conserving resources for the upcoming Boss fight is important, so it's best to try and separate the enemies to make the fight easier. To accomplish this, throw a Pebble at the Minion to lure it back towards you and fight it away from the other enemies; if you still have Throwing Knives left they can also be very useful for killing it as it tries to close in. Once it's down, move up and take out the remaining enemies before pushing onwards. Although this boss is optional, just encountering it gives you 1 Insight point, which will open the ability to level up your character back at the Hunter's Dream if you have not already done so. Even if you're defeated by the boss, you'll be able to gather up some Blood Echoes and increase your level before attempting it again, and on your second attempt you can summon Father Gascoigne to make the fight much easier if you're online. Upon defeating the Boss, the Great Bridge Lamp will appear, which you can use to return to the Hunter's Dream to level up using the Cleric Beast's Blood Echo bounty, and from there return to the Central Yharnam Lamp to continue. When you reach the steps at the top of the Wide Terrace you'll see two Huntsman's Minions patrolling the area below. Since fighting them both at the same time is very dangerous, you should try to separate them. One of them sometimes gets closer to the stairs than the other one, so if you stand roughly halfway between the stairs and the corner of the nearby building it should see you and come running. Lure this first one back to the stairs and kill it there, before moving up and finishing off the other one. At the far end of the Wide Terrace is an elevator that isn't usable yet, so follow the path up the stairs on the right. If you turn right again at the top of the stairs and go under the bridge, you'll be able to unlock another door on the bottom floor of the Bridge Residence, which will allow you to skip the Wide Terrace altogether on subsequent trips through the area. There are a large number of caged Rabid Dogs in this area, and it's important to kill them as you come to them, because if left alone they will burst out of their cages when you reach the Canal Bridge and attack you from behind. Kill the two dogs on the upper part of the area first, and then go down the stairs and kill the two just to the left, before taking out the last two on the way to the bridge. Just before the bridge you'll be able to take a path to the left, where you'll see an item sitting on the ground near the end. Before picking it up, continue around the corner and take out another Rabid Dog that's hiding there. As you cross the Canal Bridge you'll see another Rabid Dog barking angrily at a door, so run up and take it out while it's distracted With the area now clear you can knock on the door the dog was interested in and speak with the Lonely Old Woman in the house. It turns out she's looking for a safe place to spend the night while the hunt is on, but since you know of no such place at this time, you can't help her yet. It's important to remember this location, however, so that you know to return once you do find a sanctuary. Upon entering this building you'll notice a large set of stairs directly ahead, and while that is the obvious way to proceed, there is another, more lucrative way. Before progressing, however, it's worth approaching the top of the stairs and taking out the Large Huntsman that starts walking up them. Once he's down, break through the barrels and crates at top of the stairs to reveal an opening that you can drop through to reach the rafters. As you look out across the rafters you'll notice some more barrels on the right-hand side about halfway along. These are blocking another doorway that you can go through to reach a balcony, where you'll find the Eileen the Crow. If you go through all of her dialogue she will give you some items and a Gesture before telling you to continue with your hunt. Back in the main room you'll notice two bodies hanging from the ceiling with items on them, but since they're too far out of reach, you need to break the chains holding them, so that they drop down to the floor below. Wide-arcing, long-range attacks are generally your safest option for breaking the chains, but you can also shoot them if you have the bullets to spare When you're ready to proceed, go to one of the walkways around the outskirts of the rafters and drop down to the upper floor from there, taking care that you don't accidentally drop down to the lowest floor. If you killed the Large Huntsman on the stairs when you first entered, you should only have to contend with two more of them on this floor: one stationary one with his back to you on the same side as the stairs, and another patrolling on the opposite side. If the one near the stairs has not detected you yet, you can walk up slowly and use a charged attack from behind; make sure you finish him off quickly, however, because a Huntsman armed with a rifle will come running out onto the walkway near the exit and start firing at you shortly after that. Once the Large Huntsman is down, run up to the Huntsman, using the pillars and coffins for cover, and kill him before going after the final Large Huntsman. The items on the bodies that you chopped down from the rafters are on either side of the central canal on the lower floor, meaning that you need to pick a side to drop down to get the first item you want. If you stand with the stairs to your back, it's recommended that you drop down onto the left side of the canal below, so that you can get the Saw Spear first. There are a lot of Labyrinth Rats in the alcoves here, so kill them as you come to them, before picking up the Saw Spear. Once you have it, look to the back of the canal, where you'll find another alcove with some rats in it; drop down and take them out so that you can get the item they were guarding. To get the remaining item that you chopped down earlier you'll need to exit the Dry Dock and climb the ladder outside, so that you can get back to the Upper Floor, and then drop down again on the other side There are more rats in the alcoves on that side too, so deal with them first before going for the item. The ladder here leads up to the Canal Walkways, which you can use to re-enter the Dry Dock to get the remaining item on one of the bodies you chopped down from the Rafters Before you start exploring the area, however, you'll need to deal with two-rifle carrying Huntsmen and a patrolling Large Huntsman. The Huntsmen with the rifles are the biggest initial threat, so try to use the statues on the sides of the nearby bridge to block their shots as you move in to take them out. Once they've been dealt with you can focus your attention on the Large Huntsman without having to worry about incoming gunfire. If you follow the walkways along you'll be able to get some more items, as well as take out a large number of Carrion Crows that would otherwise drop down onto you if you were to run along the Canal below. Near the end of the walkway you can cross another bridge, where you'll find two more crows pecking away at a wooden coffin. Kill the crows and destroy the coffin to reveal the item that was hiding behind it The final item in this area is dangling precariously on a beam below, so you need to line yourself up carefully and drop down onto it to retrieve it If you miss the beam, simply climb the ladder and work your way back around to try again. At the end of the small canal is a wooden platform sticking out over an adjoining canal, from which you can access a ladder that leads up to the Canal Residence. If you look down below the platform you'll see an item surround by a large number of Rotted Corpses, and while they're dormant now, some of them will come to life when you get close to them, and the remaining ones will do so after you pick up the item. Try to finish off all of the ones that come to life when you drop down before picking up the item, so that you don't have to contend with them all at the same time. Once they've all been defeated, continue up the canal while taking out the enemies as you come to them. After descending the stairs in the canal, make sure you go into the small alcove on the right and get the Blood Stone Shard to help further upgrade your weapons Just past that alcove you'll have to defeat some more Rotted Corpses, and there are also two Carrion Crows sitting on a beam; use Pebbles or your gun to knock them down so that you can fight them. At the end of the canal, just to the right of the Boar Tunnel, you'll find a ladder that you can use to access the Ambush Bridge above. Head up the ladder and activate the elevator to create a shortcut back here, and then decide whether to tackle the Boar Tunnel or the Ambush Bridge first. When you approach the entrance to this tunnel you'll see a large Maneater Boar at the other end guarding a pair of items. If you stay at the entrance to the tunnel the beast will eventually charge straight at you, and you can avoid this by stepping to one side as it draws near, after which you'll be able to turn around and attack it from behind. Or, with a full bar of Endurance, if you sprint straight towards it as soon as you enter the tunnel you can get behind it before it has time to charge Once the beast is dead and you have the items, head back down the tunnel and up the ladder. Alternatively, if you crossed the Ambush Bridge first, you can climb down the ladder at the end of the bridge and sneak up behind the boar for an easy kill. Before you start crossing the bridge, make sure you've gone into the small building on the left and activated the elevator inside, as that will give you a straight path between here and the Central Yharnam Lamp - especially handy since there's a boss coming up. When you start crossing the bridge you'll notice a group of enemies on the other side, along with a mysterious ball just behind them; continue across the bridge until the enemies catch sight of you, and then backtrack quickly into one of the side alcoves along the bridge. A Huntsman with a torch will soon set the bale of hay ablaze and then a Huntsman's Minion will kick it along the bridge, killing any enemies in its path; make sure you're off to the side so that you don't get caught up in the destruction. Finish off any remaining enemies before crossing the bridge. After going up the first set of stairs leading on from the bridge you'll come to a small area with two enemies standing around an item; try to sneak up on them so that you can use a charged R2 and Visceral Attack follow-up on one of them to get an early advantage in the fight. The only thing standing between you and the next area now is Father Gascoigne, and if you've fully explored Central Yharnam you should have been able to upgrade your weapon to +2, which will aid you greatly in the battle. If you spoke to the Young Girl and got the Tiny Music Box after offering to find her mother, you can use it periodically in the fight to briefly disorientate Gascoigne, allowing you to get some easy hits in. Once he's been defeated, a new Lamp will appear near the fountain - make sure to light it, but don't use it just yet. Follow the path around to the upper part of the area and drop down onto a small rooftop to find the Red Jeweled Brooch that the Young Girl said her mother was wearing The Brooch can be used to obtain a useful Blood Gem, or you can return it to the Young Girl. When you're ready to continue, open the gate at the back of the area and continue along the path into the building at the end, and then climb the ladder to reach the small library room above. A small note containing some information that will help you piece together the mysteries surrounding the hunt can be found on one of the tables, so make sure to give it a quick read. There's also a chest near the door containing the Blood Gem Workshop Tool, which will let you fortify your weapons with Blood Gems back at the Workbench in the Hunter's Dream.